Chapel Hill, April 18, 2013 – Robert F. Patton, age 91, died Thursday, April 11, 2013, in Chapel Hill. He was born October 28, 1921 in Kentucky to Blanche McNeely and Elizur Fitzgerald Patton. Robert grew up in Rutherfordton, N.C. He was a graduate of Davidson College but two months prior to his graduation, he was called to active duty and served as an Operations Staff Sargent in the 2nd Battalion Headquarters of the 261st Infantry Regiment in World War II. Serving in the Army for three years Robert was assigned to the 65th Infantry Division that became a part of General Patton’s Third Army in France, Germany, and Austria. For his duty in Europe, Robert received the European-African-Middle Eastern Campaign Medal with 3 Bronze Battle Stars along with other honors. After the war, Robert came back and completed his degree at Davidson and went on to work for twenty years in various management positions at Sears Roebuck. He arrived in Chapel Hill in 1964 where he was the Founder and President of Interactive Computing, a company that developed custom software services for companies in the Southeastern U.S. including R.J. Reynolds, Wachovia and the Oak Ridge National Laboratory. Robert was very active in the University Presbyterian Church and many community organizations, holding leadership positions at a Civitan, American Legion, VFW and the Chapel Hill Historical Society. He received the National Daughters of American Revolution DAR Medal of Honor for his notable service. 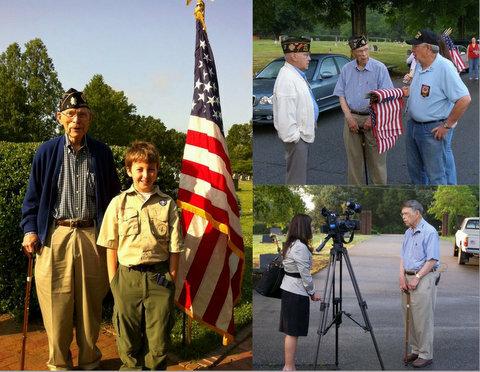 Robert Patton served as American Legion Chapel Hill Post 6. He also served as the Post’s Adjutant and as Adjutant for C. V. Cummings Chapel Hill Post 9100. He held both adjutant positions until early 2013. Robert loved to travel and enjoyed music immensely. During his retirement he organized numerous Presbyterian Fun and Fellowship trips around N.C. and throughout Europe. He was an avid Tarheel attending UNC games for fifty years. Another passion was the 65th Division Association and he worked tirelessly with this group and others to secure monuments throughout Europe and a plaque at the Mauthausen, to preserve the legacy of the 65th’s contribution. Robert received numerous Military Honors and was most proud of the Republic of France Legion of Honor Medal received at a ceremony in Raleigh on February 28, 2012. He dedicated himself to sharing his experience as a liberator of Mauthausen, speaking at numerous schools in the area and was honored to participate on the Chapel Hill Holocaust Speakers Bureau. Robert was a role model for all ages making a difference for many in his beloved community of Chapel Hill. In the last few months of his life he found great joy in helping filmmaker Matt Nash create a documentary entitled 16 Photographs at Ohrdorf which highlights Matt’s grandfather, the 65th division and the liberation of Ohrdruf Concentration Camp. Robert died on the 68th anniversary of the April 11th visit by Eisenhower who brought with him his ranking generals including Bradley and Patton to the Ohrdruf Camp. Robert was there and recounts his experience in the film. Robert had a keen mind, loved life and always had plans for today and the months ahead. He said his philosophy in life was making the impossible possible and he worked hard every day to meet many of those challenges. Robert F. Patton, US Army – Patton’s Third Army (France, Germany and Austria) and Mauthausen German Concentration Camp liberation efforts. Patton on Patton Learn about the man, ours. Holocaust Museum, Washington, DC, interview. Army World War II Uniform Presentation to Scharding, Austria, Museum.